Yes we know, a map like this covers a large area and you have a very small block. 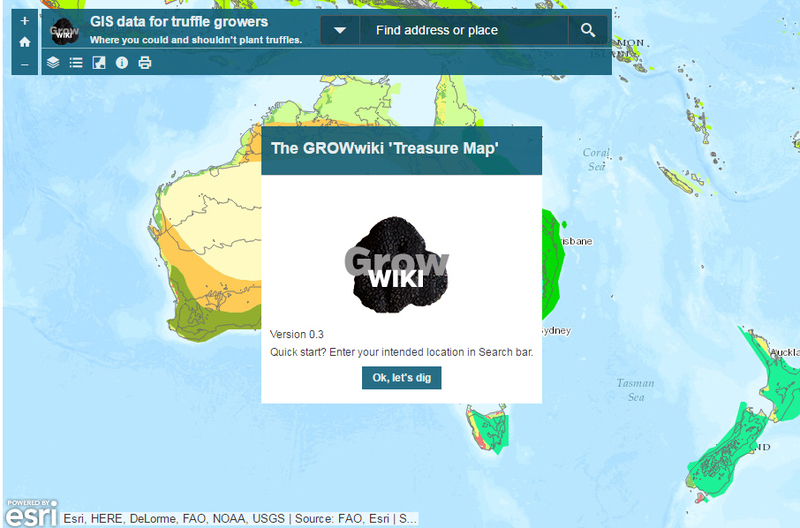 It won’t be any substitute to individual testing and research, but it might give you quick ‘Forget it!’ if you see the conditions are way outside what we suggest in our GrowWIKI Site Selection pages. Start by searching for the location of your (intended) property. Zoom out (let it load, it’s including a lot of data) to look at surrounding areas, or use the grey Layers symbol to examine available characteristics (or turn off that Climate Zones layer on top for example). You can turn on/tick just one layer or when all are overlayed, click on your set point, and there will be a pop with a > next arrow that steps through the data available for that area. Remember you are looking for the right climate areas (Mediterranean was considered ideal because it mapped the European experience, but now we know that areas marked ‘Marine’ can also produce), soil type (we know sandy loam is ideal, clay is not), pH (higher is better, 7.0 to 8.0) you’ll still add a lot of lime so it probably doesn’t matter except what the original soil is, other than for reducing the cost of modifying it, and temperature range (summer and winter averages – truffles need cold winters, warm but not prolonged hot summers. Some winter 0 -4º days are good, mid to high 20º’s for summer is perfect ). And then if there are good rainfall averages it will help fill your dam, as you’ll almost certainly need to irrigate in our dryer Australian summers. And then you’ll need to calculate the impact of climate change for when, 5-10 years down the track you’ll be producing. Click to view this WebMap online full screen – it opens a new tab. The Rainfall Averages data is licensed from the Bureau of Meteorology correct at June 2016 * That’s Marcos Morcillo’s tongue-in-cheek term for his map of where truffles grow in Europe. Aaaarh…if there’s treasure, there has to be pirates.